The Capital Grille is a nationally acclaimed fine-dining restaurant that specializes in dry aged steaks, fresh seafood, and an award-winning wine list. Offering professional service in an atmosphere of relaxed elegance, we feature an on-site butcher who dry ages our steaks between 18 and 24 days to maximize quality and hand-sculpts each cut of steak to order. An advanced sommelier curates the wine list, which features more than 350 selections. “Best of Award of Excellence” from Wine Spectator - one of 19 in the state of Arizona, and 13 years in a row! 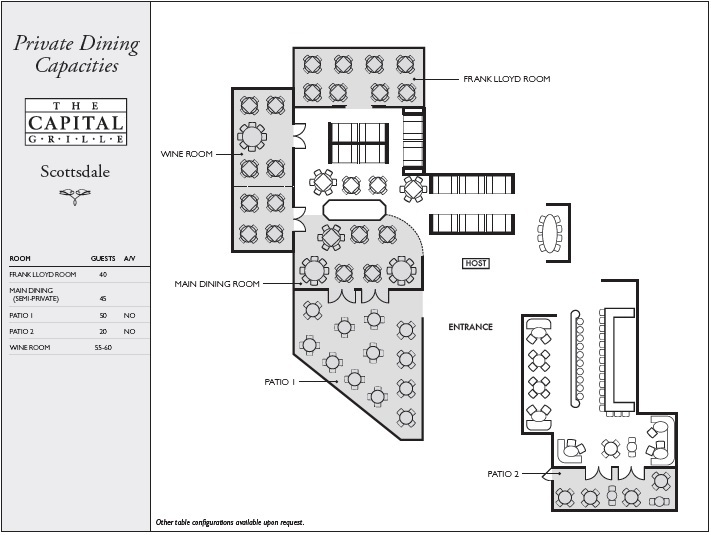 The Scottsdale Dining Room offers 2 fully private spaces that accommodate up to 60 guests, a dining room that accommodates 250, and two exterior patios seating up to 55. Audio visual capabilities are available as well as complimentary valet provided. Please contact Stephen Roussel at Scottsdale@tcgdine.com or 480.348.1700 to book your group events.